The v4 Tiger fire bull whip is now available. You can now customize your fire whip by choosing between two handle lengths, your choice of color markings and an optional light weight guard. All whips come with three shadow cord crackers. 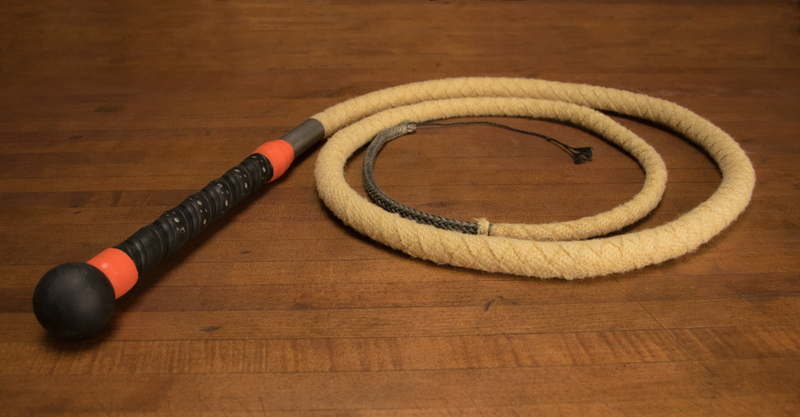 This bullwhip is measured from the back of the handle to the end of the Kevlar plaiting, based on a 18" handle. Total length may vary up to 6". The Tiger Whip has seven layers of Kevlar and Technora plaiting, creating a gradual taper along its entire length. This precise taper makes the whip much easier to crack. The 3/4" 7075 aluminum handle is gripped and has a rubberized ball on the end to prevent hand-slippage and ensure complete control. All models include a 3" aluminum collar between the Kevlar wicking and the gripped handle, and for additional protections you can upgrade to a light weight guard. While these options help keep your hand at a safe distance from the flames, we still recommend some type of fire resistant gloves be worn during use. To add a personal touch and make your whip identifiable, we wrap silicone tape in the color of your choice around the collar and at the opposite end of the handle. We offer a light weight, 3" aluminum guard as an extra layer of protection against flames traveling up the whip and burning your hand. We still recommend that you always use a protective glove with or without the guard. Many artist do prefer whips that do not have a guard, as it can interfere with your cracks if the whip travels too close to the handle during a crack. Instead of the typical Kevlar thread crackers, we've created our crackers out of the same material our Shadow Cord is made from, just the 2x stronger version. The stiffness of this cracker makes these whips even easier to use, and these 2x Shadow Cord crackers last 2-3 times longer then standard Kevlar thread crackers. We include three crackers with each whip.